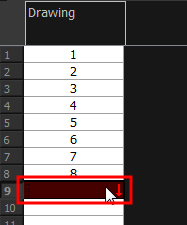 Right-click on the selection and select Create Cycle or in the Timeline toolbar, click the Create Cycle button (you may have to customize the toolbar to display it). 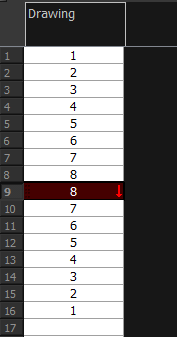 Enter the number of cycles you want, including the current selection. From the top menu, select Edit > Copy Cell from Timeline or Xsheet or press Ctrl + C (Windows/Linux) or ⌘ + C (Mac OS X). ‣ From the top menu, select Edit > Paste Cycle. ‣ Right-click and select Paste Cycle. ‣ Press Ctrl + / (Windows/Linux) or ⌘ + / (Mac OS X). ‣ In the Number of Cycles field, enter the number of cycles you want to paste. ‣ Increase or decrease the number of cycles you want to paste. ‣ Normal (forward): Pastes cycles as for all cycles, starting with the first cell of your selection and ending with the last. ‣ Reverse: Pastes cycles in the reverse order of the original selection, starting with the last cell of your selection and ending with the first one. ‣ Forward > Reverse: Pastes the first cycle in your selection as is, then the following one in reverse order. This repeated until all cycles are pasted. ‣ Reverse > Forward: Pastes the first cycle in your selectionin reverse order, then the following one as is. This repeated until all cycles are pasted. NOTE: You can perform the same operation using the Paste Special dialog box. To open the Paste Special dialog box, select Edit > Paste Special or press Ctrl + B (Windows/Linux) or ⌘ + B (Mac OS X)—see How to copy and paste a motion using Paste Special. 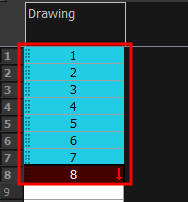 In the Timeline or Xsheet view, select the cell range to paste in reverse order. ‣ From the top menu, select Edit > Paste Reverse. ‣ Right-click and select Paste Reverse. ‣ Press Ctrl + . (Windows/Linux) or ⌘ + . (Mac OS X).